The Kent County Show on 6, 7, 8 July 2018 will host The Royal British Legion’s iconic ‘Every One Remembered’ sculpture as well as a display of handcrafted poppies made by the local community to commemorate 100 years since the First World War ended. 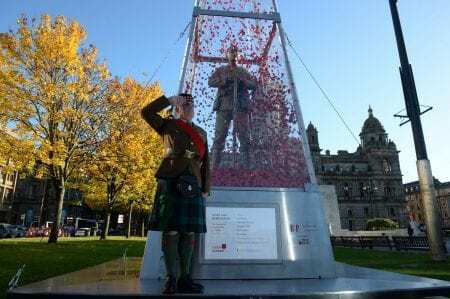 The unique installation provides a fitting tribute to the sacrifice of British and Commonwealth servicemen and women during the First World War. The sculpture, designed by award-winning artist Mark Humphrey, features the ‘Centenary Soldier’ standing on a plinth of limestone sourced from the Somme. The statue, manufactured by Universal Creations Ltd, is finished in bombshell brass which is inspired by the artist’s own grandfather who inherited a brass bombshell, decorated by his great-grandfather in the trenches when he fought in the Somme in 1916. The ‘Every One Remembered’ sculpture, which has previously been in place in Trafalgar Square London, Cardiff City Centre, St Georges Square Glasgow and proudly located outside the Theatre Royal in Newcastle Upon Tyne, is encased in a Perspex™ obelisk manufactured by Bay Plastics Ltd. It is joined by thousands of poppies which flutter around the soldier. Visitors to the Show will be able to donate to The Royal British Legion at the memorial next to the Garden Life Marquee and add a poppy to the sculpture. Alongside the ‘Every One Remembered’ sculpture will be a community built knitted poppy display which will be hosted inside the newly located Garden Life Marquee. 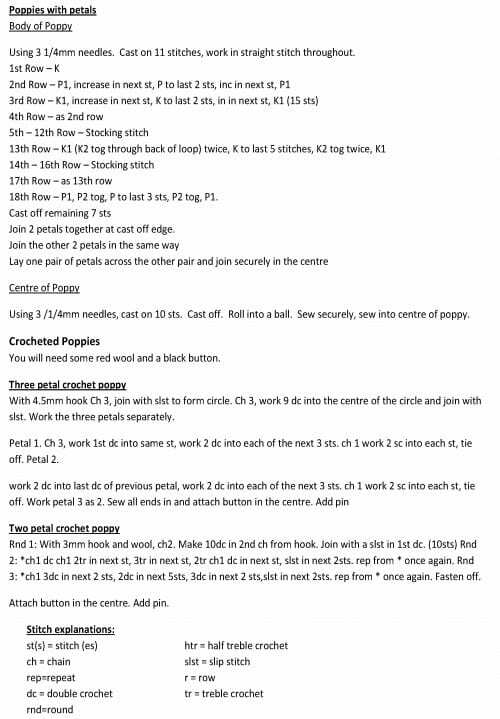 To create the display, the Kent County Show is appealing to members of the public to send in their knitted poppies. Poppies can be knitted, crocheted or crafted from felt. 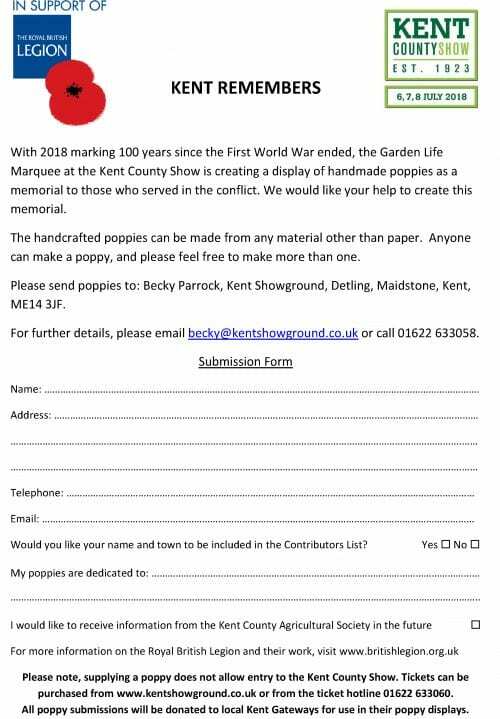 Contributors can also send in their details to be included in a contributors list and can dedicate their poppies if they wish. Following the Show, poppies will be donated to local council gateways across Kent to increase the displays planned for November. attraction at the 2018 Kent County Show. 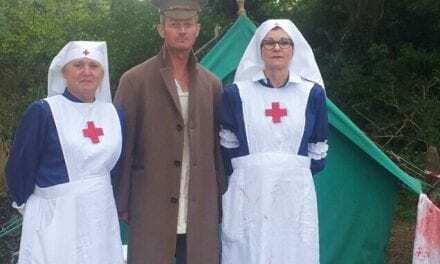 Thank you to the Kent County Show and Royal British Legion for sending this press release and using Educational Life as a platform to share this information with our community. 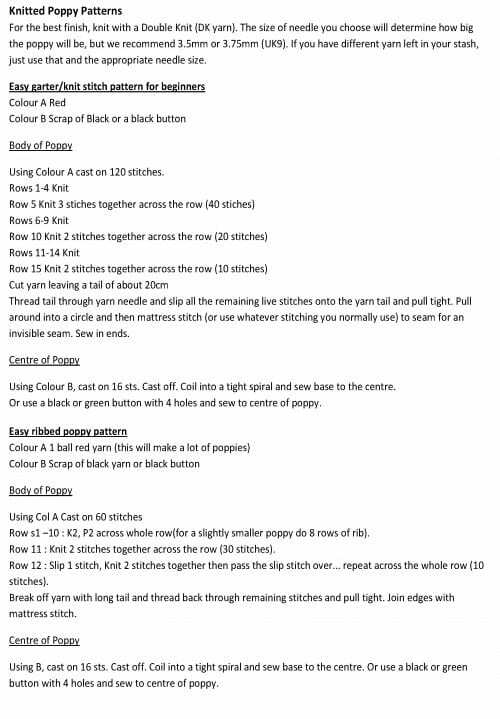 If you would like to make a poppy to donate to the display, by all means, please follow the link above to read the full article about the project but to make it as straightforward as possible we have included the patterns below courtesy of Kent County Show and The Royal British Legion.